Weston's Nathan Katz swims to victory in the 200-yard individual medley at the Class M state swimming championships at the Cornerstone Aquatics Center in West Hartford March 14, 2018. WEST HARTFORD — There was just no stopping the Weston High School boys swimming and diving team in its quest for its sixth consecutive state title. 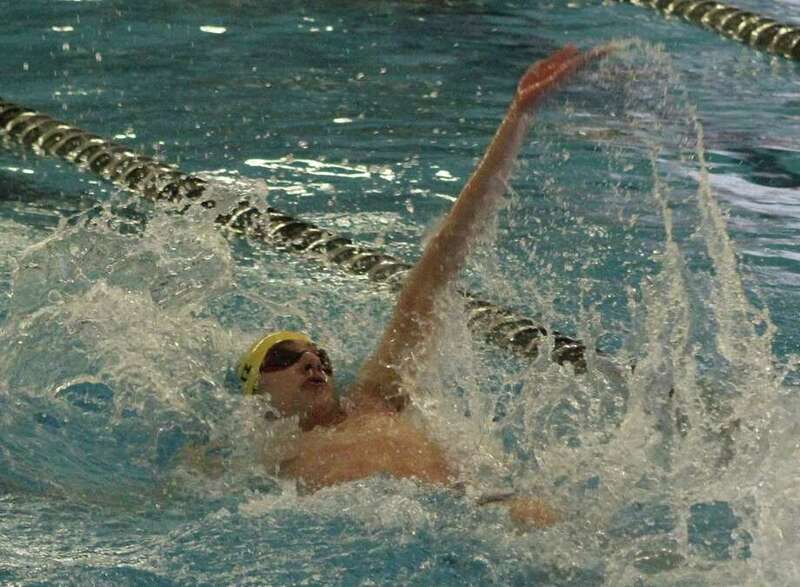 Despite qualifying only nine swimmers and four divers, the Trojans piled up 644 points to win the Class M championship meet, which culminated with the swimming events Wednesday afternoon at the Cornerstone Aquatics Center. Daniel Hand finished second with 583.5 points, followed by Wethersfield (547), Notre Dame of West Haven (373) and Suffield/East Windsor (342.5). It’s been quite a run for Weston, which had won four straight Class S titles before winning the last two Class M crowns. The Trojans have placed either first or second in their state championship meet every year since 2006, and have captured three consecutive runner-up trophies at the South-West Conference championships as well. Weston entered the swimming portion of the event with a handful of points in its pocket from the diving competition, which was held on Friday at Bulkeley High School in Hartford. All four Trojans divers placed in the top 15, led by state champ Liam Simmons (443.45 points) and Parker Smith in sixth place (361.20). Weston won all three relays and took first in three individual swimming events. The Trojans opened Wednesday’s festivities with a win in the 200-yard medley relay, with the team of Mateusz Babinski, Charles Palsho, Katz and Mitchell Levi finishing in 1:37.49. Weston won the 200 freestyle relay, with the quartet of Oscar Petersen, Levi, Joshua Franco and Babinski clocking in at 1:30.91. The Trojans put an exclamation point on the end of their championship run with a victory in the final event of the day, the 400 freestyle relay, with the foursome of Petersen, Franco, Palsho and Katz finishing in 3:15.79. Katz also won the 200 individual medley (1:53.80) and the 100 butterfly (51.78), while Palsho won the 100 breaststroke (58.09). Babinski took second in the 100 butterfly (52.84) and Petersen finished second in the 100 freestyle (48.67). Hand moved up to second place with a strong showing in the 100 backstroke. Christopher Wu won the event (53.41) to lead three Tigers in the top five. That performance put Hand within striking distance of Weston at 31.5 points behind with two events to go. Paul O’Connor then took second for the Tigers in the 100 breaststroke (1:00.16), and Hand’s 400 freestyle relay team of William Porter, Nathan Imbergamo, Tyler Merritt and Wu placed second (3:16.60). Alfred North Hansen won two individual events for Notre Dame of West Haven, taking the gold in both the 200 freestyle (1:53.80) and the 500 freestyle (4:35.52). Blake Fulton of Wethersfield won the 100 freestyle (48.46) and placed second in the 100 backstroke (53.94). Timothy Joyce of Bethel won a pair of silver medals, placing second behind Hansen in both the 200 freestyle (1:45.51) and the 500 freestyle (4:46.91). Will McCleery of North Haven won the 50 freestyle (22.18), followed by New Fairfield’s Paul Riter in second (22.24). Team scores: 1. Weston 644; 2. Daniel Hand 583.5; 3. Wethersfield 547; 4. Notre Dame-West Haven 373; 5. Suffield/East Windsor 342.5; 6. East Lyme 309; 7. Avon 295.5; 8. Masuk 277; 9. New Fairfield 249; 10. Berlin 246.5; 11. Torrington 211; 12. North Haven 209; 13. Barlow 180; 14. Bethel 158; 15. Foran 130; 16. Jonathan Law 117; 17. Lyman Hall/Coginchaug 81; 18. Windsor 64; 19. Bulkeley/HMTCA 58; 20. Kaynor Tech 25; 21. Waterford 10. 200-Yard Medley Relay: 1. Weston (Mateusz Babinski, Charles Palsho, Nathan Katz, Mitchell Levi), 1:37.49; 2. Wethersfield (Blake Fulton, Caleb Skowronek, Austin Bovino, Holden Hoon), 1:40.39; 3. Hand-Madison (Christopher Wu, Paul O’Connor, Dylan Merritt, John Beiner), 1:40.45; 4. Suffield/East Windsor (Sam Tesko, Mike Stavolone, Timur Couture, Matthew Winter), 1:41.25; 5. Masuk (William Briand, James O’Shaughnessy, Michael Aiello, Matthew Hull), 1:44.64; 6. Berlin (Kurt Bauer, Connor Recck, Andrew Roberti, Kiernan Jennings), 1:46.72. 200 Freestyle: 1. Alfred North Hansen, Notre Dame-West Haven, 1:41.48; 2. Timothy Joyce, Bethel, 1:45.51; 3. Tyler Merritt, Daniel Hand, 1:45.62; 4. Oscar Petersen, Weston, 1:45.83; 5. Joshua Franco, Weston, 1:47.97; 6. Edward Platonov, Jonathan Law, 1:48.07. 200 IM: 1. Nathan Katz, Weston, 1:53.80; 2. Christopher Wu, Daniel Hand, 1:59.27; 3. Andrew Yu, Barlow, 2:01.02; 4. Holden Hoon, Wethersfield, 2:01.41; 5. Paul O’Connor, Hand-Madison, 2:01.80; 6. Daniel Chen, Daniel Hand, 2:01.93. 50 Freestyle: 1. Will McCleery, North Haven, 22.18; 2. Paul Riter, New Fairfield, 22.24; 3. Andre Richard, Avon, 22.39; 4. Viktor Nemesvari, Torrington, 22.47; 5. Charles Palsho, Weston, 22.58; 6. John Stoeffler, North Haven, 22.68. Diving: 1. Liam Simmons, Weston, 443.45; 2. Hadden Gaunt, Wethersfield, 245.45; 3. Brendan Downey, Avon, 276.90; 4. Matheus Silva, Kaynor Tech, 252.60; 5. Ben Prouty, East Lyme, 234.90; 6. Parker Smith, Weston, 361.20. 100 Butterfly: 1. Nathan Katz, Weston, 51.78; 2. Mateusz Babinski, Weston, 52.84; 3. Mike Stavolone, Suffield/East Windsor, 54.06; 4. Austin Bovino, Wethersfield, 55.04; 5. Andrew Roberti, Berlin, 55.90; 6. Holden Hoon, Wethersfield, 55.99. 100 Freestyle: 1. Blake Fulton, Wethersfield, 48.46; 2. Oscar Petersen, Weston, 48.67; 3. William Porter, Daniel Hand, 48.71; 4. Connor Recck, Berlin, 48.99; 5. William Briand, Masuk, 49.61; 6. Viktor Nemesvari, Torrington, 49.66. 500 Freestyle: 1. Alfred North Hansen, Notre Dame-West Haven, 4:35.52; 2. Timothy Joyce, Bethel, 4:46.91; 3. Joshua Franco, Weston, 4:49.48; 4. Tyler Merritt, Daniel Hand, 4:50.13; 5. Joseph Nizzardo, Masuk, 4:52.92; 6. Ethan Skuches, Foran, 4:53.96. 200 Freestyle Relay: 1. Weston (Oscar Petersen, Mitchell Levi, Joshua Franco, Mateusz Babinski), 1:30.91; 2. Notre Dame-West Haven (Benjamin Hassen, William Hinckley, Cameron Jurzyk, Alfred North Hansen), 1:31.11; 3. Daniel Hand (John Beiner, William Porter, Dylan Merritt, Tyler Merritt), 1:31.21; 4. Avon (Justin Arroyo, Alec Traktovenko, Christopher Chute, Andre Richard), 1:32.18; 5. Berlin (Connor Recck, Andrew Leary, Peter Cugno, Kiernan Jennings), 1:33.58; 6. North Haven (John Stoeffler, Tanner Powell, Carlo Frunzio, Will McCleery), 1:34.23. 100 Backstroke: 1. Christopher Wu, Daniel Hand, 53.41; 2. Blake Fulton, Wethersfield, 53.94; 3. Daniel Chen, Daniel Hand, 55.23; 4. Andrew Kulp, New Fairfield, 55.63; 5. Nathan Imbergamo, Daniel Hand, 55.78; 6. Jake Wyse, Suffield/East Windsor, 57.65. 100 Breaststroke: 1. Charles Palsho, Weston, 58.09; 2. Paul O’Connor, Daniel Hand, 1:00.16; 3. Andrew Yu, Barlow, 1:00.63; 4. Connor Recck, Berlin, 1:00.91; 5. Mike Stavolone, Suffield/East Windsor, 1:01.57; 6. Caleb Skowronek, Wethersfield, 1:03.61. 400 Freestyle Relay: 1. Weston (Oscar Petersen, Joshua Franco, Charles Palsho, Nathan Katz), 3:15.79; 2. Daniel Hand (William Porter, Nathan Imbergamo, Tyler Merritt, Christopher Wu), 3:16.60; 3. Wethersfield (Holden Hoon, Caleb Skowronek, Shane Bresnahan, Blake Fulton), 3:18.43; 4. Notre Dame-West Haven (Alfred North Hansen, William Hinckley, Shawn Parrott, Cameron Jurzyk), 3:19.98; 5. East Lyme (Eain Goolsbey, Jack Zhang, Jack Mucciarone, Robert Hahn), 3:30.64; 6. Avon (Justin Arroyo, Alec Traktovenko, Christopher Chute, Andre Richard), 3:30.93. You have the diving final scores incorrect. According to the CIAC website, you reported the seed score and not the final results score for the diving competition.